The Deck/Floor mount version of the Covermate 3 is ideal for your inground swim-spa or spa. The advantages of lifting covers (especially swim-spa covers) with automated handling makes a world of difference to the ease of using your swim-spa. Many customers wonder how on earth they managed prior to adding these excellent lifting devices and now find that their enjoyment and frequency of use of their swim spa has increased well beyond expectations. The CoverMate III has had a product update, so that the "wind lock bar" is no longer needed. See below for the update information from Leisure Concepts. 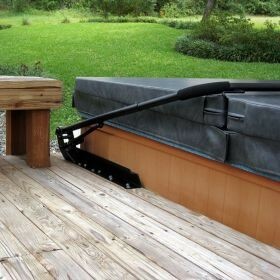 Leisure Concepts has changed the shocks that are being used with the CoverMate III Plastic Bracket cover lift. Due to this change, the lock bar is no longer necessary to ensure the cover remains in the upright position. The new shocks (item # 101510) have been tested and proven to support the spa cover when in the upright position without the use of a locking mechanism. · The metal plate that was installed on the inside of the lock bar bracket. · The 3/8 x 2-3/4" hex cap bolts that held the metal plate on the bracket. · The large black dome caps that went over the locknuts holding the bolts on the metal plate.